On the hike back to my car I paused every so often for a full minute of stillness to look, listen and feel at the natural happenings around me. 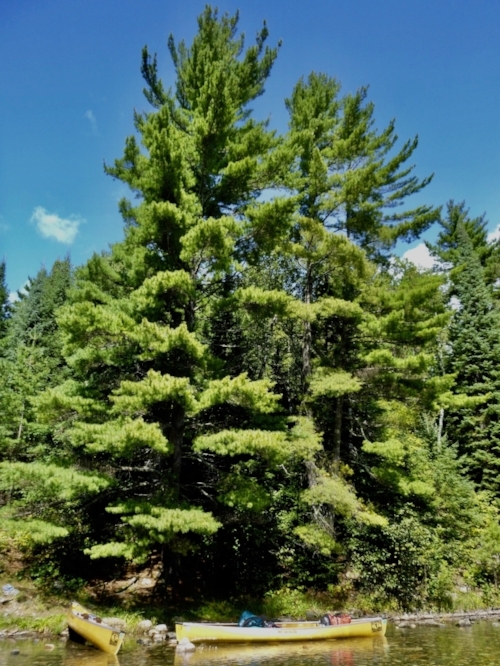 In some places I had a broad view of the river or of conifers growing along a ridge. In other places I zeroed in on the natural minutia of a rotting log on the forest floor or the tepid water at the base of a beaver dam. In each place I found delight, curiosity, calm, and a sort of companionship. Where each experience of Renewal intersects with the others is in the intention we set to disrupt the straight-line sensibility that our front-country lives so often demand of us. We do not retreat to find solutions to the (legitimate) urgencies that pepper our days. We retreat to renew our sense of capacity and connectivity, so that we may return with the strength that our work in the world deserves. As we approach the end of one season and the beginning of the next; in this liminal place where the heat of summer days start to tease us with an occasional cool breeze in the evening; as the creative urgency of yesterday ebbs and our audacious ambitions for tomorrow flow; I thought it might be worth dipping into the archives to share a mediation that I shared last autumn, from a Beauty Walk with a group of MECA students in Fore River Sanctuary in Portland. The recipe for renewal is simple. For instance, last weekend renewal was comprised of one river, two canoes, three nights, four humans (one canine), five poems, six or seven mosquitoes, and a generous dash of inspiration. Don’t get me wrong, wilderness experience is not easy. Indeed often even the approach to wild places consists of hefty obstacles that cross a whole spectrum of categories (more on those another time). But profound encounters with natural places, elements, and habitants are at their profoundest when they take the simplest possible forms. Floating on a river. Propelled by a paddle. Breath. Laughter. Picnics. Some scratches in a journal. An eagle’s perch. A loon’s call. The therapist and I talked about the upcoming canoeing and backpacking retreats that I’ll be guiding. I described to her the slow and intentional pace of a Renewal in the Wilderness trip. I told her how we make space for solitude and reflection as well as community and inspiration. I told her how our trips are surely adventures, but more saturated in serenity than they are soaked with adrenaline. She sighed and said how beautiful it would be to join a Renewal trip, especially as a relief and ballast in her line of work as a therapist. She just wasn’t sure that she could afford the trip. Then I got to say my favorite thing that I get to say: "We’ve got you covered!" Owning stuff like a fancy car or jewelry doesn’t make me happy. Unless it’s 2-6 canoes. Owning 2-6 canoes makes me happy. The winds on the lakes in Maine are jerks. The black flies in Maine are also jerks. But then the jerk winds keep away the jerk black flies. There’s a lesson in there somewhere. March always ends. And you will make it through. And then March will come again. But at least you’ll remember that it has ended before. That if you’re patient, you’ll continue NOT getting what you want, but you will get what you need. And probably catch a killer sunset or sunrise in the process. I learned that although it’s probably a terrible idea to stare into a baby rattlesnake’s eyes for the better part of 45 minutes in a canyon 2 days away from help, if you do find yourself doing this thing you probably shouldn’t do, you’ll come out on the other side knowing that you’re more powerful than you give yourself credit for. And that this power is part of something bigger that you can’t fully describe. Maps provide the stuff of dreams. Aram Mitchell, one year later, is still the most unrelentingly delightful, kind, and thoughtful person to share a work life with that ever existed. IT DOESN’T MAKE SENSE. He’s got to be some kind of humanoid delightful robot sent from the future. The world has hurt many of us in very deep ways. This year it felt particularly hard to be a woman (among many other identities) as we collectively sweat out the trauma many of us have experienced. But being in the wilderness with strangers this year has taught me that trusting people doesn’t make you some kind of nit-wit; it means you’re brave. I learned that the place nestled in between anxiety and heartbreak is the tender place. And being in the tender place is also brave. I’m not in control. And that’s okay. But I’m still going to pack my waterproof matches and a compass. start to the winter morning. by crowding heaps of snow. Then I turn a corner. I relished his observations and the conclusion that there is more for us to glean from wilderness than an understanding of the sum of the parts. Wild spaces and humans are expressions of the same spirit. We need one another. This week I got to walk with some of the students at the Maine College of Art. We moved through the many thresholds that make up the Fore River Sanctuary and contemplated the state of our morale, the necessity of collaboration, and the ways that our work/art impacts the world. Along with the lake miles we paddled in the Boundary Waters Canoe Area last week, my fellow wilderness wanderers and I also had about ten portages. All together our portages totaled several miles of carrying our gear and canoes over rugged terrain to bypass the shallow rapids that connected one lake to the next. What I found beautiful about our carries was the collaboration that compelled us. We got the job done on every one, but never in a rush, never singularly, and never by moving our outfit from lake to lake in a way that compromised our capacity. By sharing the load, and when necessary taking multiple trips, we managed to sustain our energy so that we could finish our route and still keep our eyes open long enough at the end of the day to watch the moon rise over the water. The most profound insights are like a good piece of outdoor gear. They are well worn, heavily used and sturdy. This is one such insight: There is a great measure of strength to be found in the embrace of our limitations. To those of you compelled by the work of bettering the world, I hope you find the strength from day to day to carry your weight, and what’s more I hope that you remember with each step that the entirety of the load is not yours to bear. Let’s get the job done. And then let’s spend some time at the end of each day reflecting on how we can sustain our strength to do our work again tomorrow. This past weekend, Aram and I led a trip in the Wild River Wilderness area of the White Mountains National Forest in New Hampshire. The events surrounding Charlottesville happened while we were in the woods, away from screens. And I’ve returned from one Wilderness to find myself in another metaphorical Wilderness...Wondering if we as a society are bending away from justice in that long arc of the moral universe MLK, Jr. and abolitionist ministers spoke about. When I’m in the real Wilderness (with trees and rivers or the vast landscapes of deserts), my heart quiets and my mind stops. I have space to listen. The proverbial Wilderness of the world doesn’t disappear, but somehow becomes more manageable. And in the approximate words of Audre Lorde, self-care becomes an act of political resistance. As I type this, my dog is sleeping quite soundly next to my feet; making little high-pitched bark noises as she dreams. She’s tired and content from running around and swimming in the Wild River. And the recent vitriol of the actions of hate groups in Charlottesville feels strong. But so do I. For those of you on the front lines navigating hatred, caring for our vulnerable populations, and helping move us towards justice in the arc of the moral universe, Renewal in the Wilderness stands with you. Aram and Opal the Canoe Dog. Aram and the July 15th Pleasant Mountain crew. Last Saturday Fiona and I guided a small group from our Beauty Walk community on a day-hike following the blue-blazed trail to the blueberry-speckled summit of Pleasant Mountain. We paused at the summertime trickle of water that falls through the Needle’s Eye crevice partway up the mountain. Fiona passed out several haikus by Matsuo Basho that we each read in turn. We read translations of the poetry. Fiona read them back to us in their original Japanese. At the summit we composed haikus of our own, articulating something of our experience on the mountain that day into a few breaths of poetry. Few things have had a more profound effect in my life than the experience of walking sensitively with others in the wilderness - hearing their reflections, seeing their expressions, sensing their connections. For me, sharing a trail, a stream, a way in the wild is poetry in the flesh. A sort of material spirituality. It’s hard to explain. I love it. Looking out over Lake Umbagog National Wildlife Refuge in New Hampshire. Photo credit: Nate Conroy. As we walked I carried a poem in my pocket just in case the urge to ponder something profound presented itself. But in the end I left it pocketed, and we simply walked with quiet scuffles over uneven terrain and the thuck thuck thuck of boots sunk shallow in the sticky mud of early spring. The calendar claims spring, but the relentless drudgery of snow and ice makes me question it, huddling in, seeking only safety and warmth in my own walls. But I committed to venturing out, and, reluctant, I pull myself from my shell, and go forth to find renewal. Up on the Eastern Promenade last Saturday morning we went looking for contrasts. The wind was biting at the top of the walk, and the air all but still once we reached the shoreline. The beauty of the water was marked by intermittent caps of white before us, and the buzz of the city held fast in its concrete over our shoulders. The chaos of our work and world back home was punctuated by the calm of the moment at hand. In the middle of Baxter Woods in Portland there is a ring of benches that invite passersby to come, sit and reflect. At our Beauty Walk yesterday we did just that. In fact we followed the impulse of the trees around us and we circled the woods three times, returning to the center ring between subsequent jaunts, to reflect on a portion of Aldo Leopold’s tale of the “Good Oak” in A Sand County Almanac.